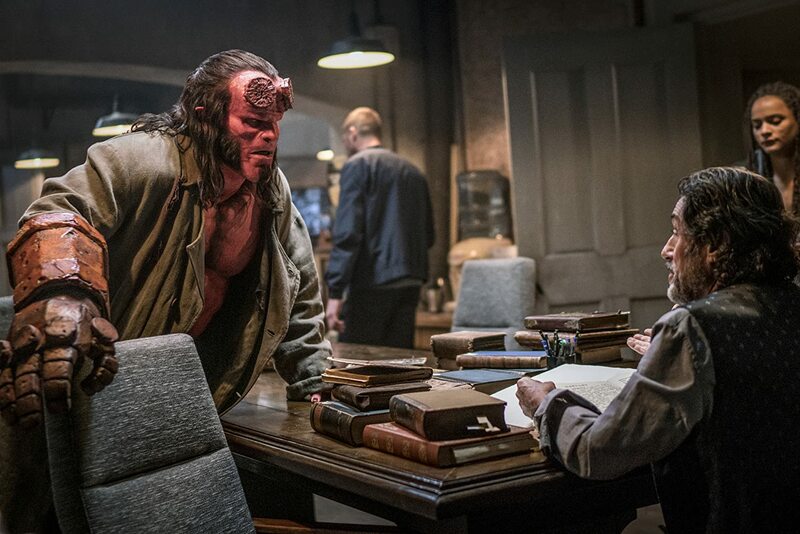 Horrendous in almost everyway, the Hellboy franchise reboot falls flat on its face with bad dialogue, a boring story and utterly disengaging action sequences. There is quite literally nothing good about this film. Directing his first cinema feature release in nine years, Neil Marshall helms the Hellboy franchise reboot. Wiping the slate clean of Del Toro’s duo of Hellboy films, released in 2004 and 2008, this incarnation features David Harbour as the infamous, heavy handed demon killer and it is terrible. 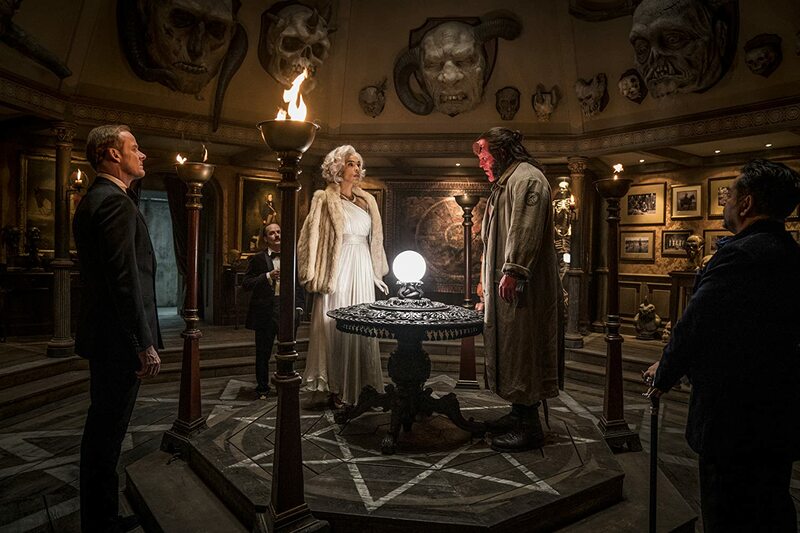 With practically no positive elements to it Hellboy (2019) is a train wreck of a film that bumbles along its weak plot with horrendous dialogue, shoddy action sequences and a painfully cringe-worthy soundtrack. It is clear that having been given the go-ahead to have the film rated R (or 15 here in the UK) Neil Marshall and Andrew Cosby (writer) decided they could sell the film on cussing and gore and neither are even close to being strong enough to hold up this flop. Hellboy begins with Ian McShane (who has replaced John Hurt as Hellboy’s adopted father) narrating the tale of Nimue, The Blood Queen. 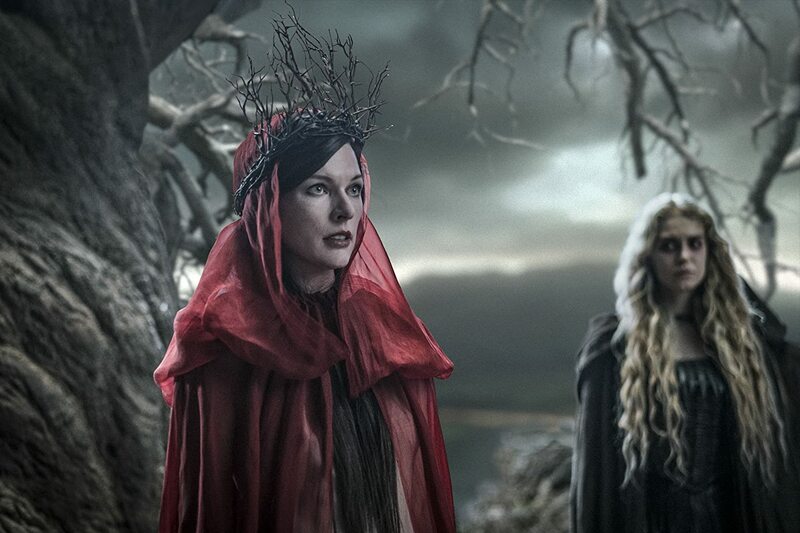 An evil witch from the dark ages that threatened to destroy humanity with a plague only for her plan to be foiled by King Arthur (a fact the film really rubs in your face). Whilst unable to die, Nimue’s body is severed into several pieces by Excalibur with each piece being locked in a box and sent to the far corners of the land, hidden away for centuries. Fast forward to the present and Hellboy is tracking down a BPRD agent gone missing. Hellboy finds the agent, who also happens to be his friend, fighting in a Lucha Libre wrestling match. The agent then challenges Hellboy to a fight revealing that he is actually a deadly vampire and Hellboy kills him. 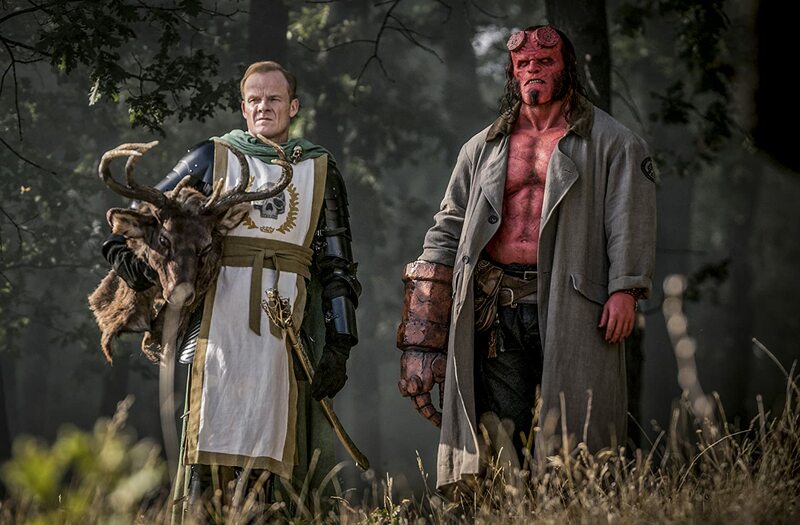 Devastated at the loss of his friend Hellboy is puzzled by his final words “The end times are coming.” Hellboy leaves, meets up with his father and then is promptly sent to England to deal with the possibility of one of Nimue’s body parts being discovered. That all happens within about 10 minutes of the opening credits and the audience is forced to make an emotional connection with Hellboy over the death of his friend, even though we don’t know his friend and are not aware of their relationship beyond what Hellboy says during the fight and before we’ve had time to think about it, it is all over. That pretty much sums up the rest of the plot. Events move at a ridiculous pace and for the most part are quite crazy with no explanation. You’ll find yourself wondering what is actually going on more than once throughout the story due to the insanity of what is happening on screen as the film offers no help whatsoever navigating it. This wouldn’t be a bad thing if the script and screenplay were better. You can have crazy events full of insane characters acting in bizarre ways and it all happening at a rocket pace without it ruining the film if you have the proper script to contain it properly and tell the audience everything they need to know in quick fire dialogue. Instead Cosby opted to just have characters swearing all the time (which is incredibly forced resulting in it being very distracting). David Harbour does his best as the new Hellboy and actually does a pretty good job considering the film around him otherwise is horrendous. He nails the voice and attitude but brings his own creative influence to it so that he stands apart from Ron Perlman’s version. However this incarnation of Hellboy is incredibly petulant and whiny (which is revealed at the end to be a purposeful character decision made by the writers) making him completely unrelatable throughout most of the film. This is a tremendous shame because whilst Hellboy is literally a demon he is generally the most grounded character in his comic books and previous films acting as a bridge between the human world and the supernatural world, operating with a cool head that audiences find so attractive about his character. This incarnation of Hellboy on the other hand is more like an angsty teenager who’s going through a phase of hating his Dad. The villains are barely worth mentioning but Minue is played blandly by Milla Jovovich and is supported by Stephen Graham playing the pig monster Gruagach. Whilst Minue is threatening because of her seemingly limitless power, both her and Gruagach suffer from some of the most boring dialogue any villain has ever had on screen. Nothing about their plans, their relationship or their motives are surprising or interesting, they’re both just evil because the plot demands it. The film suffers from very poor editing throughout which is coupled with weak cinematography, especially throughout the action sequences. However strangely enough the best action sequence comes right at the very end after the main plot has been resolved. It is almost as if there was a clear direction for this new iteration of the franchise to go in and it got there right in the last five minutes. The rest of the film features disorientating shaky cam, bad to awful CGI and editing that is far too quick for the mind to keep up with it. The one thing that really made Del Toro’s Hellboy standout was the amount of physical real life prosthetics in many characters coupled with a sparing use of CGI to fill out what you can’t do with make up all nicely wrapped up with Del Toro’s easy to follow camera placements so the audience can clearly see what is happening at all times. This version however seemingly does the opposite, opting for more CGI than is necessary (not in all instances but in most) and close ups on the fighting cut together at way too fast a pace resulting in an unpleasant viewing experience from an aesthetic view point. Furthermore the film features a horrendous soundtrack. Whilst the heavy metal music itself is not the problem it is the usage of it that hurts the scenes in which it is found. Hellboy will say some sarcastic line then start yelling as a fast hard rock/metal guitar riff comes in. The intended effect is for you to lean forward in your seat with a smile on your face and go “f**k yeah.” But what actually happens is you lean back in your seat, sigh and watch, completely disconnected, as some CGI monster throws Hellboy around a bit. This is not a good film. Fans of the character will be disappointed with this incarnation even if David Harbour does his best with what he is given and film-goers in general will be put off by the bad CGI, awful plot and script and the general lack of care that has gone into this release. This is a paint by numbers action film with a big name attached to it. Sadly this doesn’t even come close to living up to that name.